This is a story about my lovely tiny watch, you can see the picture below. My watch is like an ordinary watch, only it’s very precious one to me. Why? Because this is my special birthday gift from my mom, my 16th birthday.. I also wear my watch when I sleep, cook, wash dishes, take a bath, and many other regular things that I do every day. I just take it out when I do laundry, but right now it’s over 😦 There is a little story about my watch, when my mom bought that watch 7 years ago, both of us just look for the suit watch for me among the hundreds watch in display window. I still remember the store name, it is SABAR (patient in Indonesian), the seller was a bald old man, my mom has just get a big prize that week, and she decided to bought me a watch. 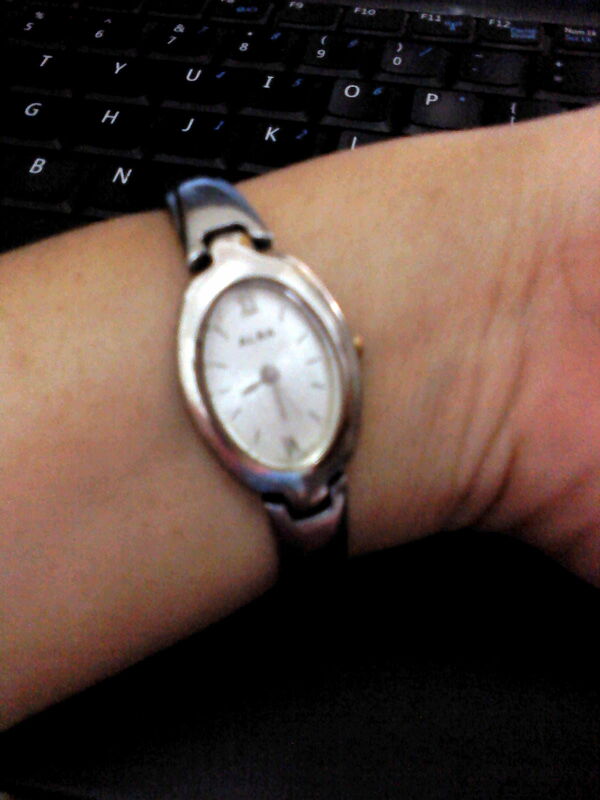 Mostly, my little wrist looks thinner with regular female watch, but my mom found this watch and I can’t say anything except ‘GREAT!!’. I’m so happy, because my wrist is look suit with the watch. The shape is ellipse, and it looks classy, simple and humble. The best word I can say is, this is so me. This watch is always be with me, in sadness and happiness. Always show me the time, or just make me feel great. Only a few people, that I allowed to hold my watch, not because I keep it tightly, but I only take it out of my hand infrequently. I still remember when the last time I took a new battery for my watch, it is in Carrefour Rungkut, and it gonna be the last I replace a new battery for my watch, I shouldn’t do it anymore because my heart watch is already broken and no one can fix it. I can’t believe that I cried when I typing this post..
Today, I assume that maybe my watch just need a new battery to make it work, but when I took it to watch reparation, the expert say that my watch is already broken, and no battery can make it work. I just sad, and go back. My mom is always saying that she is happy when I wear that watch until now. Even though I believe that my mom will understand the situation, but I remain sad. Finding a suit watch for me, is not easy, because I must fall in love with that watch and that watch must suit my little tiny wrist and only make it perfect. Good bye my 7 years old watch, no one can replace you in my heart. Not only because you was special, but all the moment with you were hard to forget..